Social media demands knowledge management to refocus on broad participation and the active role of individuals as both consumers and contributors at the same time. To make sense of these developments within organisations, knowledge management approaches need to connect the dynamic and fluid social media interactions of individuals and in informal communities with stability and institutionalization in a formal organisational environment. Towards that end, knowledge maturing is a novel perspective on knowledge creation in and across organisations. 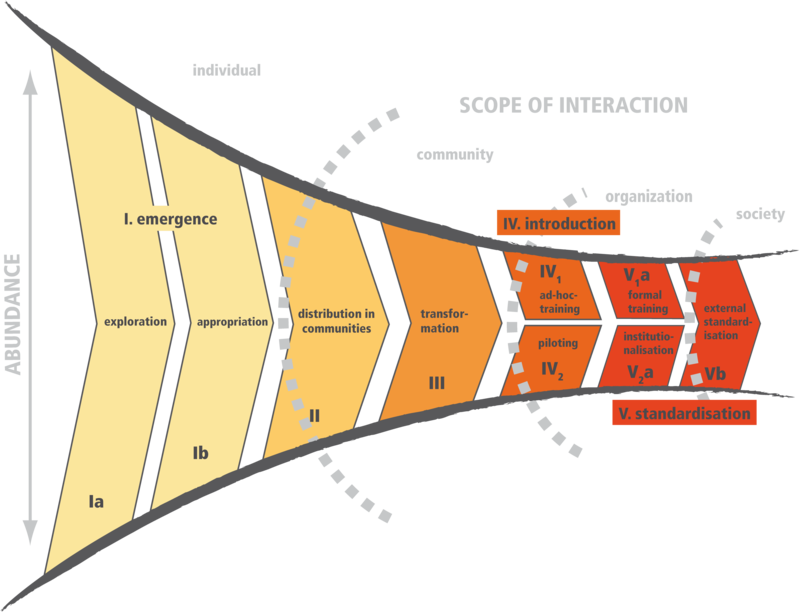 The knowledge maturing model contributes to theories of organisational knowledge creation by structuring the collective development process into characteristic phases which are not passed in a strictly linear way. I. Emergence. Individuals create personal knowledge by pursuing their interests in browsing abundant knowledge spaces inside and beyond the organisation, opening up for new knowledge and the changes it might bring about. Knowledge is subjective, deeply embedded in the originator’s context and the vocabulary used for communication might be vague and restricted to the originator. Based on the findings of our studies, we revised this phase to include two sub-phases, exploration and appropriation. Ia. Exploration: New knowledge is developed by individuals either in highly informal discussions or by browsing the knowledge spaces available inside the organisation and beyond. Extensive search and retrieval activities often result in loads of material influencing creative processes of idea generation. Ib. Appropriation: New knowledge or results found in the exploration subphase that have been enriched, refined or otherwise contextualised with respect to their use are now appropriated by the individual, i.e. personalised and contributions are marked so that an individual can benefit from its future (re-)use. While many initiatives for knowledge management have focused on sharing knowledge or even detaching knowledge from humans as “media”, individuals also require support for appropriation, at least in a more individualistic culture. II. Distribution in communities: The first phase in the scope of communities describes interactions between individuals driven by social motives and the benefits that individuals typically attribute to sharing knowledge. These are, among others, belonging to a preferred social group, thus increasing the probability of getting back knowledge from the community when one needs it. Distribution is not meant in the sense of a one way street of individuals contributing new knowledge that they have committed to. The phase includes discussing the new knowledge, negotiating its meaning and impact, co-developing knowledge, convincing others and agreeing plus committing to the knowledge as collective. From the perspective of semantics, a common terminology is developed and shared among community members. III. Transformation: Artefacts created in the preceding phases are often inherently unstructured and still highly subjective and embedded in the community context which means they are only comprehensible for people in this community due to shared knowledge needed to interpret them. Transformation means that knowledge is restructured and put into a form appropriate for moving it across the community’s boundaries. Structured documents are created in which knowledge is de-subjectified, sometimes formalised using established containers and context is made explicit to ease the transfer to collectives other than the originating community. IV. Introduction: Knowledge is prepared with a specific focus on enhancing understandability, handed on and applied in an ad-hoc manner in trainings in which a selected group of users is instructed using didactically prepared material. We found two primary interpretations of this first phase in the scope of organisation, i.e. (1) an instructional setting called ad-hoc training and (2) an experimental setting called piloting. IV1. Ad-hoc training: Documents produced in the preceding phases are typically not well suited as learning materials because no didactical considerations were taken into account. Now the topic is refined to improve comprehensibility in order to ease its consumption or re-use. Individual learning objects are arranged to cover a broader subject area. Tests allow to determine the knowledge level and to select learning objects or learning paths. IV2. Piloting: Typically, not every implementation detail can be foreseen in the transformation phase. Knowledge is arranged in a way so that it can be applied in a dedicated, specific experiment involving not only the creators of knowledge, but other stakeholders. Experiences are collected with a test case before a larger roll-out of a product, a service to an external user community, e.g., customers or stakeholders, or new organisational rules, procedures or processes to an organisation-internal target community such as project teams, work groups, subsidiaries or other organisational units. V. Standardisation: The knowledge is further solidified and formally established in the organisation to be used in repeatable formal trainings, work practices, processes, products or services. As in the introduction phase, we distinguish an instructional setting with standardised training activities, called formal training, and an experimental setting turning pilots into standard organisational infrastructure, processes and practices, called institutionalisation. The term standard, finally, can also refer to external standardisation initiatives which are similar for both settings, transcend the organisational boundaries and move knowledge maturing to the scope of societies. V1a. Formal training: In an instructional setting, the subject area becomes teachable to novices. A curriculum integrates learning content into a sequence using sophisticated didactical concepts in order to guide learners in their learning journeys to capture a subject area thus increasing the probability of successful knowledge transfer. Learning objects are arranged into courses covering a broader subject area. Learning modules and courses can be further combined into programs preparing for taking on a new role or for career development. V2a. Institutionalisation: In the organisation-internal case, formalised documents that have been learned by knowledge workers are solidified and implemented into the organisational infrastructure in the form of processes, business rules and/or standard operating procedures. In the organisation-external case, products or services are launched on the market. They are institutionalised into the portfolio of products and services offered by the organisation. Vb. External standardisation: The ultimate maturity sub-phase is very similar for both paths, the instructional and the experimental path, and covers some form of standardisation or certification. On an individual level, qualifications and certificates confirm that participants of formal trainings achieved a certain degree of proficiency which is comparable across institutions. On an organisational level, certificates allow organisations to prove compliance with a set of rules that they have agreed to fulfil. Concerning products and services, certificates show compliance to laws, regulations or recommendations that can, should or must be fulfilled before a product or service can be offered in a certain market.